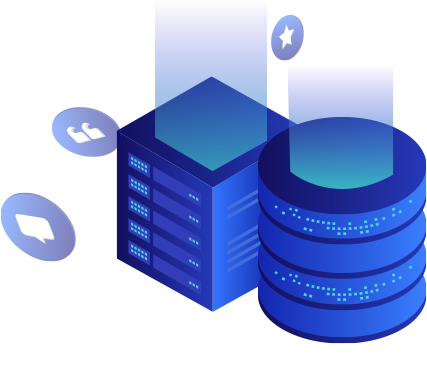 Shared hosting: provision of a graphic user interface to enable access to Customer materials, including web pages and electronic mail, over the Internet. Linux virtual private servers: provision of hardware resources in a shared environment, accessible over the Internet using a remote terminal (SSH), capable of supporting a wide variety of applications, limited by our Acceptable Use Policies contained herein and the hardware and software limitations described in the product specification. Windows virtual private servers: provision of hardware resources in a shared environment, accessible over the Internet using a remote desktop (RDP), capable of supporting a wide variety of applications, limited by our Acceptable Use Policies contained herein and the hardware and software limitations described in the product specification. Backup virtual private servers: provision of hardware resources in a shared environment, accessible over the Internet using a remote terminal (SSH), specifically to be used to store second copies of important data to facilitate disaster recovery and other as-needed use cases, also limited by our Acceptable Use Policies contained herein and the hardware and software limitations described in the product specification. All KVM VPS service resources, including CPUs, are dedicated to You and are therefore not subject to fair use guidelines. We retain backups of KVM VPS service data on a best-endeavour basis. Upon notification or discovery that You are performing actions that violate Our policies, We will suspend Your services until the issue has been resolved to Our and/or the notifying party’s satisfaction. Upon providing Us with all the information required so as to enable us to understand how the abuse happened and how you plan to prevent it in the future, we may unsuspend the account for a fee of $10, that would cover the cost of handling the abuse complaint. If We pursue an abuse report, You incur a cost, and We later determine that You were operating within the provisions of this agreement, We will credit Your service for the number of days of suspension. You agree that We shall not be liable for any damages arising from such causes beyond Our direct and exclusive control. You further acknowledge that Our liability for Our own negligence may not in any event exceed an amount equivalent to charges that You have paid Us for services during the period damages occurred. In no event shall We be liable for any special or consequential damages, loss or injury. We are not responsible for any damages or loss of income Your business may suffer. We do not make implied or written warranties for any of our services. We deny any warranty or merchantability for a specific purpose. This includes loss of data resulting from delays, non-deliveries, wrong delivery, and any and all service interruptions caused by Us. You must maintain accurate and current identification information with Us through the duration of Your service with DraculaServers. We may verify any change in information, and if We is unable to obtain verification, We may suspend or terminate Your service. Dracula Servers reserves the right to cancel a customers service at any time. If cancellation is caused by customers violation of these policies, then no refund is due. Customers may cancel service at any time, but no refund is due. Dracula Servers does not offer refunds on any services under any circumstances. If you wish to cancel your services, you must notify us five (5) business days prior to your renewal date. If your notice of cancellation is not received within this required time frame, you will be liable for payment of the proceeding month and hereby agree to complete payment as invoiced accordingly. Dracula Servers does not offer any refunds on web hosting including dedicated servers and VPS. You may cancel your server at any time however no refunds will be issued. Licenses and add-ons are non-refundable. If You initiate a dispute or chargeback, or threaten such action, DraculaServers may terminate Your services immediately and without further notice. We utilize services by Maxmind and Fraudrecord to automatically process all new orders. All new accounts may be subject to a manual account review. All invoice payments for existing services by Subscribers may be subject to random manual reviews. Our automated billing system runs daily at 12:00am CST (-8 UTC). If You do not pay the invoice by the 1st day after the invoice is due, We will suspend Your service and a late fee of 10% of the invoice will be issued. You will be notified that Your service has been suspended. If You do not pay the invoice by the 3rd day after the invoice is due, We will terminate Your service, without notice. Upon termination, Your service data will be irrevocably deleted. We strive to provide a consistently excellent service. If You wish to make a complaint, please write to us by email to support@draculaservers.com. We will respond to Your complaint within 10 working days.